This is a high speed road bike that we make. It’s the MERIDA Speeder 20 that we’ve put our top of the range highest speed 1000W kit onto with the largest capacity 48V 17.5Ah PANASONIC Tiger Shark lithium ion battery. It’s a real buzz riding this. The bike is a top of the line flat bar road bike, it has a Shimano SORA gear system on it and very strong hydraulic Tektro disc brakes to pull you up quickly. 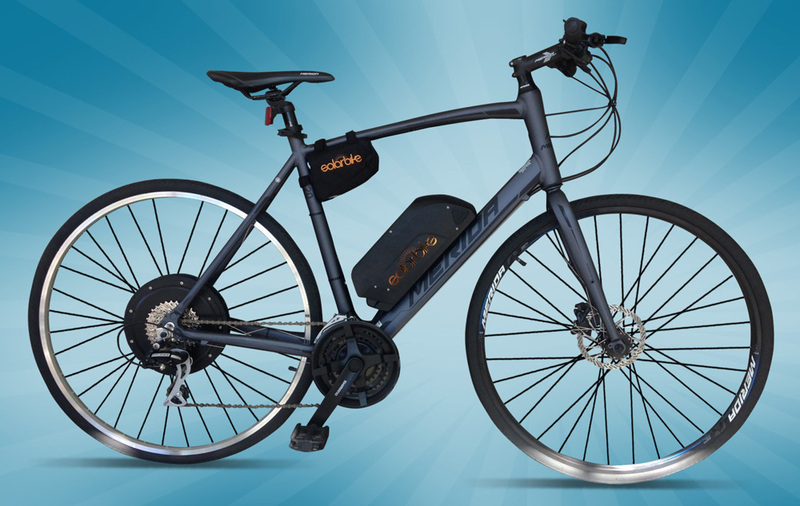 The battery gives you a great range and this bike will get you to where you want to go quickly. Keep in mind that 200W is the legal limit. The 200W version is quite a bit cheaper $2200) as well and propels you nicely along at roughly 30km. Definitely a good bike for those wanting to pedal a lot and need a fast commuting machine!